Before railways and modern roads, the Monmouthshire and Brecon Canal was the industrial artery of south Wales. It is shown here starting at Brecknock, at the top of the drawing, and following the mountainside for most of its 33-mile journey to the junction with the Monmouthshire Canal at Pontymoile. Tramways, the horse-worked railways of the pre-locomotive era, are indicated across the Brecon Beacons. 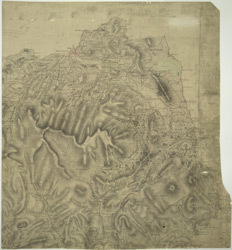 Used to carry coal, iron ore and limestone from the mines to the valley's furnaces and ironworks, they are highlighted in yellow ochre on the plan.